Now here’s a garden in a city! When we planned the visit we wondered. 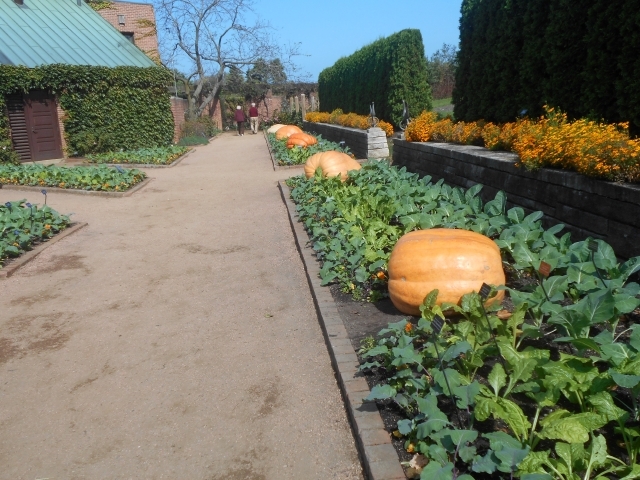 . . a botanic garden in October? In Chicago? Probably lots of grasses and fall perennials, some annuals playing off evergreens, and respectable hardscape. Oh yes, chrysanthemums, too. We were mistaken. There is so much more here. We visited on a blue-sky sunny day, unseasonably warm for October, a day when you want to linger. The garden is about an hour’s train ride north of Chicago, in the suburb of Glencoe, a pleasant mile or so walk from the station. We arrived late morning. We left late afternoon, reluctantly, as the sun’s long rays burned amber and our knees turned creaky. 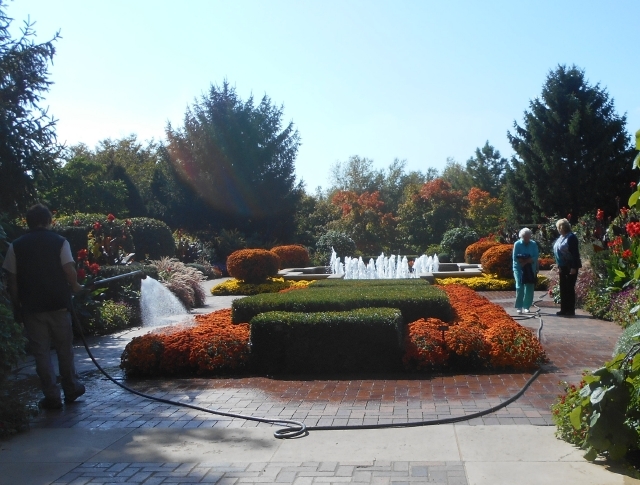 This 50-year-old garden is a modern class act that sweeps clean Chicago’s erstwhile inferiority complex. Brawling stockyards, sooty railroads and bloviating politicians once heartily amused east-coast elites (though that midwest beef did taste mighty good). The sheer elegance of the Columbian Exposition in 1893, rising so soon after a destructive fire twenty years earlier,* was a watershed that changed the equation. 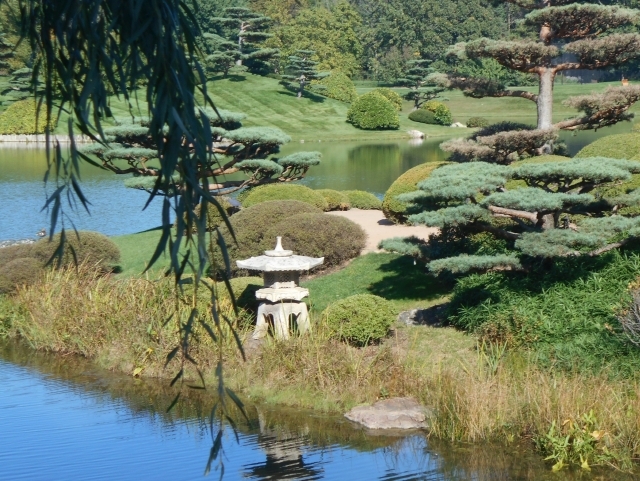 So it comes as no surprise that the Chicago Botanic Garden is top tier, a creative amalgam of vision, artistry, science and philanthropy. Hard to believe as you explore, but the garden, according to its creator, John O. Simonds, is a “story of transformation…A whole new landscape of hills, streams, lakes and islands was shaped from depleted fields and grossly polluted drainage ways.” The largest island hosts most of the mini-gardens. It’s a smart layout. Additions and changes came gradually to the 50-year-old garden, but the long-term plan was never compromised. You can meander through an inner loop easily on foot, then take a tram tour of the outer loop for a change in perspective and a closer view of the artificially created prairie. 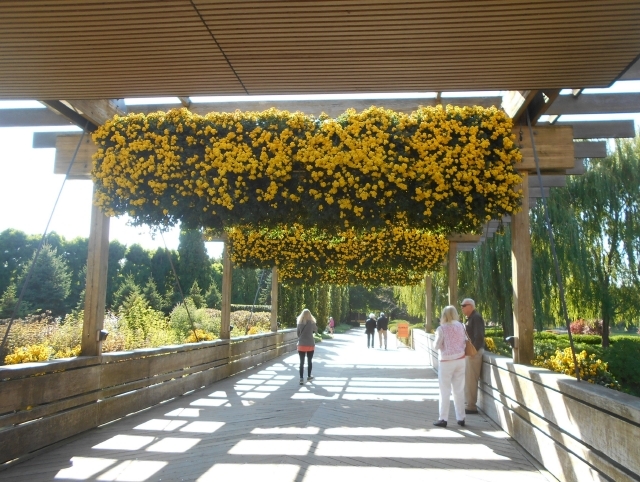 Yes, there were chrysanthemums. Quilt blocks of vibrant color stretched among beefy parterres that march in tandem through the Esplanade. Crisp hedges and weeping willows, and shafts of sunlight puncturing deep shade, invited us to pause, which we could not because we were just beginning and full of energy. Later, maybe. We skirted the less appealing native garden where signage urges people to save a place for natives among lawns and landscape. Dreadfully difficult, this devotion to natives in a home garden. 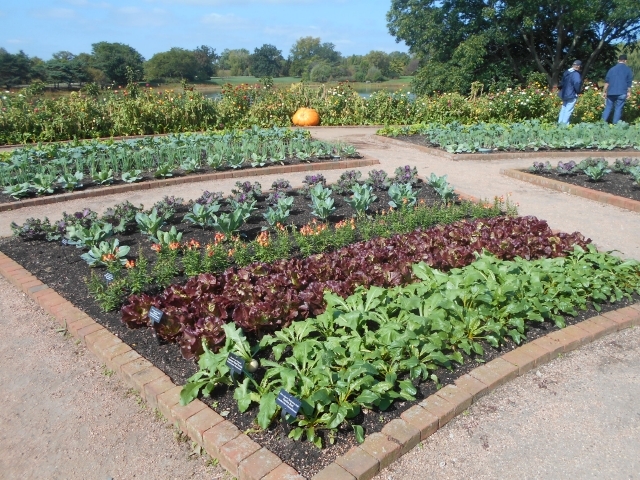 Oh, that huge and mouth-watering Fruit and Vegetable Garden set off in blazing sun. Full of delectable how-to’s for growing, pruning, displaying and caring for your choice of crops from pumpkins to blueberries, cabbages to sunflowers. Briefly, in my enthusiasm, I considered razing a score of trees on our land, sculpting the ground and bringing in tons of top soil for vegetables that would surely be luscious. But then I remembered I didn’t have an endowment. 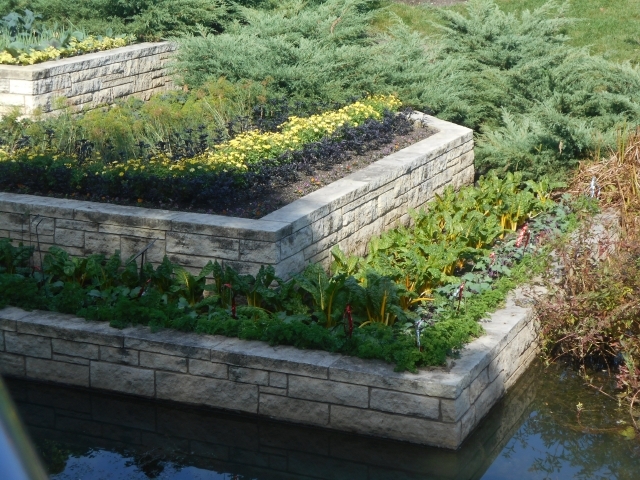 Terraces and natural plantings slip directly into lake edges, creating a seamless transition between water and land. Early on there were erosion problems, but they have been pretty much solved by a combination of underground berms and riprap that are invisible to the casual visitor. What a stroller can see are ribbons of plants along the shore whose solid roots keep soil in place. A good object lesson for owners of waterfront property. There are lessons everywhere. Or, more precisely, ideas. Ideas for rousing color, or textures that make you want to reach out and touch, bold combinations and soft contrasts, raised beds, classic allees and cozy garden rooms. 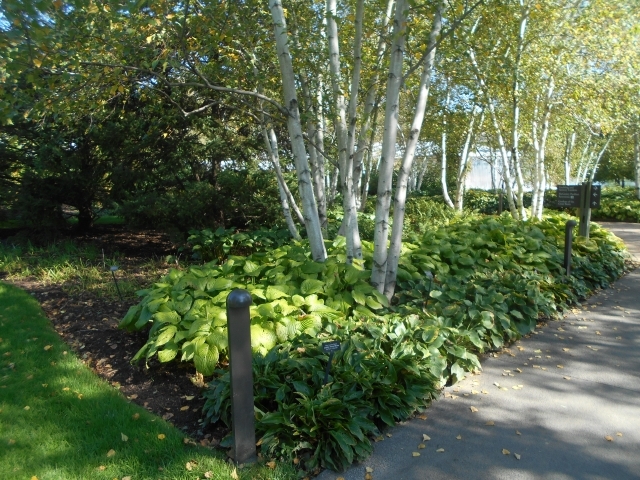 A home landscape garden with nine beds features different styles for different yards in the midwest. 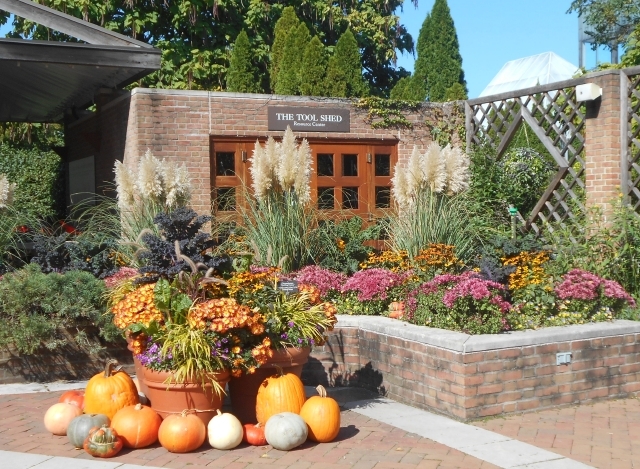 There is a colorful Heritage Garden, and within it a circular Physic Garden modeled after Europe’s 16th century botanical gardens where old-world plants could be studied for their healing properties. But here’s the twist: this garden features new-world plants, too. 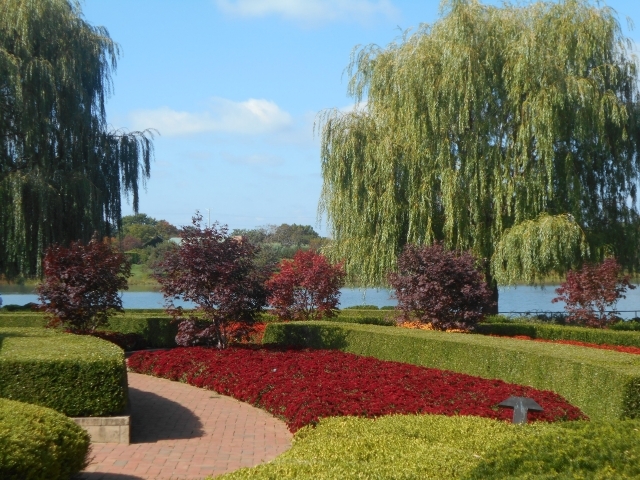 We heard the carillon in the distance on Evening Island, so inviting. 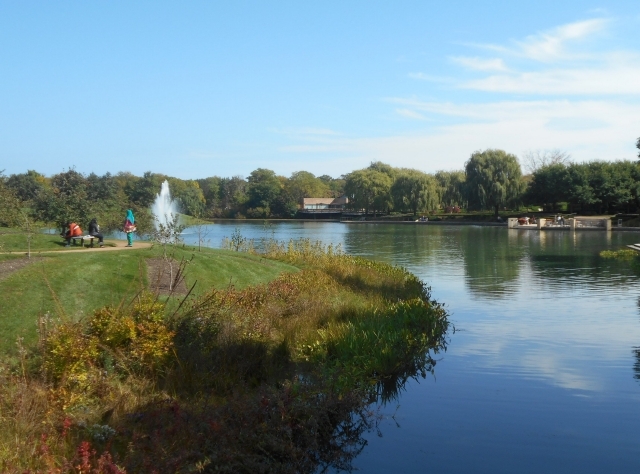 Sunlight bathes this island in the afternoon, best time to explore its five acres of woodlands, meadows, and lakes, a lovely microcosm of the midwest landscape. It’s designed for solitude and strolling, though it can also be a gathering place for outdoor events. Worth noting: American Girl Doll donated 12 million to this garden. Serious creative design went into its planning, which took six years to complete. We viewed Evening Island from the tram in late afternoon, last view of the garden before we left to catch a train back to Union Station. We did not have time to dally here on foot, though we thoroughly enjoyed the background on the garden that our driver gave us. We found out there was more to explore here for another day.